The UN Security Council on March 2 unanimously adopted a resolution imposing new and broader sanctions aimed at stemming advances in North Korea’s nuclear and missile programs and its arms trade with other states. Resolution 2270, prompted by Pyongyang’s nuclear test on Jan. 6 and launch of a satellite using ballistic missile technology on Feb. 7, is the fifth resolution passed by the council on North Korea and nonproliferation since 2006. The new resolution is “the strongest message” that the Security Council has delivered to North Korea since Pyongyang decided to abandon the nuclear Nonproliferation Treaty (NPT), Román Oyarzun Marchesi, Spanish ambassador to the United Nations and chair of the council’s specialized sanctions committee on North Korea, said during a March 2 press briefing. North Korea announced its withdrawal from the treaty in 2003, an action that NPT members have not officially recognized. Oyarzun highlighted a “number of new elements” in the resolution, including a ban on the export of aviation fuel to North Korea, a requirement that states expel North Korean representatives engaged in activities prohibited by previous Security Council resolutions on North Korea, a requirement that states inspect all North Korean goods transiting their territories, “severe restrictions” on North Korea’s ability to operate a fleet of foreign-flagged vessels, a ban on the export of specialized minerals, and “unprecedented” provisions on banking. The resolution closes gaps in the arms embargo imposed by the earlier resolutions, he said. It also blocks North Korea’s access to its assets in other countries, imposes a travel ban on more than two dozen new entities and individuals, and names 31 specific vessels subject to the asset freeze. States have begun to enforce the new nonproliferation measures, specifically the requirement of states to inspect all cargo within their territory traveling to or from North Korea by land, air, or sea to ensure that no items are transferred in violation of Security Council resolutions. 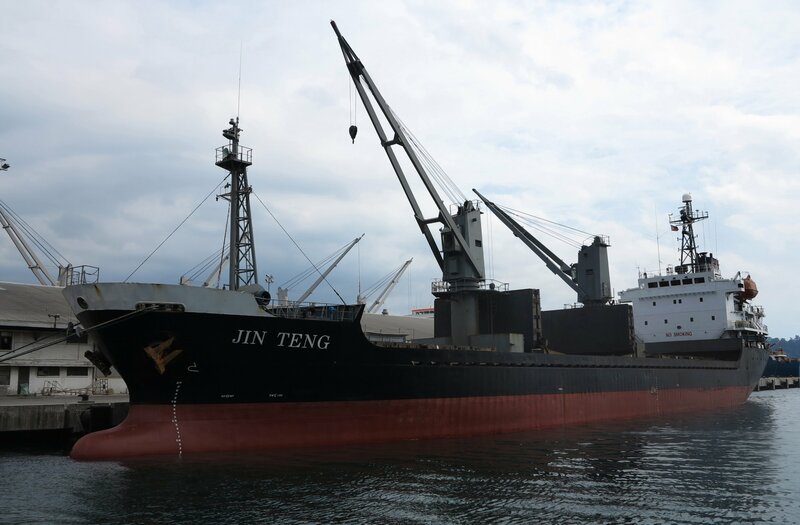 In a March 5 story, the Associated Press quoted Charles Jose, spokesman for the Philippine Department of Foreign Affairs, as saying that his government will impound a North Korean ship, the MV Jin Teng. The cargo ship is listed in an annex to the new resolution as being owned by a sanctioned North Korean company. Under the resolution, the Philippines is required to inspect the vessel for illicit goods and repatriate the North Korean crew. Through an official at the Philippine embassy in Washington, Jose told Arms Control Today in a March 20 email that “the Philippines continues to hold [the] MV Jing Teng” and that Philippine authorities “found nothing suspicious or irregular” when they inspected the ship’s cargo. The Philippines subsequently released the ship, according to a March 24 Reuters report. The panel report, which was released Feb. 24, describes North Korea’s disregard for the council’s past demands, finding “no indications that the country intends to abandon” its nuclear and ballistic missile programs. It cites Pyongyang’s advancements during the period covered by the report, from February of last year to this February, including launches of short-range and submarine-launched ballistic missiles and a nuclear test in January. The multinational panel of experts was established in 2009 and has issued reports nearly annually since then. Despite existing financial sanctions that aim to limit its access to the international financial system, North Korea “continues to gain access to and exploit” the system by using aliases and a network of front companies, among other measures of deception, the panel said. Transactions that circumvented financial sanctions directly contributed to North Korea’s ability to launch a rocket in December 2012, the report says. According to the Security Council, the space launch violated previous resolutions because it used ballistic missile technology. North Korea also “remains actively engaged in the trade of arms and related materiel,” according to the report. Pyongyang has attempted to ship various arms-related equipment to Egypt and Syria in recent years, as well as engage in other banned activity with states in Southeast Asia, Africa, and the Middle East, the report says. The report includes several recommendations for the Security Council, including encouraging member states to fulfill obligations to report on their sanctions enforcement activities and demanding that the states prevent the training of North Korean scientists in sensitive fields that “could contribute” to the country’s prohibited programs. The panel also suggests several corporation names and aliases to be added to the list of entities and individuals subject to financial sanctions. Individual states have ramped up sanctions against North Korea in light of the country’s nuclear and missile tests. Japan, South Korea, and the United States have stated an intent to undertake new national nonproliferation measures against North Korea. On March 16, U.S. President Barack Obama signed an executive order prohibiting certain financial transactions with Pyongyang and freezing U.S.-based North Korean assets. The order fills legal gaps in U.S. implementation of Resolution 2270 and the new sanctions adopted by the United States on Feb. 18. The South Korean Ministry of Unification announced new national sanctions on North Korea on March 8. South Korea will expand targeted financial sanctions against individuals and entities responsible for the development of nonconventional weapons and “strengthen control over shipping related to North Korea,” according to a statement made by Lee Suk-joon, minister of government policy coordination, on behalf of several government agencies. Seoul also promised to “fully implement existing sanctions” by “strengthening on-the-spot crackdowns and control” over shipments between North and South Korea. On Feb. 10, Seoul announced the unilateral closure of the Kaesong Industrial Complex, a joint venture between the two Koreas. Pyongyang and Seoul have suspended activity at Kaesong amid tensions in the past. South Korea has enforced “comprehensive sanctions” against North Korea since 2010, according to the ministry statement. Japan said in a Feb. 10 statement that it also has undertaken “measures of its own” against North Korea. The new sanctions against Pyongyang are aimed at taking “the most effective approach toward the comprehensive resolution of outstanding issues of concern, such as the…nuclear, and missile issues,” Japan said. The sanctions include restrictions on the movement of persons between North Korea and Japan, a ban on large cash transfers from Japan to North Korea, and a ban on entry to Japanese ports of all North Korean-flagged vessels “including those for humanitarian purposes.” Japan also declared an asset freeze on additional entities and individuals. The Chinese government prefers to operate under the “cover of UN Security Council resolutions” rather than enacting national sanctions, China expert Jonathan Pollack of the Brookings Institution said in a March 22 interview, although China is “seriously intent” on implementing the resolution. In recent weeks, North Korea has continued to issue threats, including some against the United States, through the state-run Korean Central News Agency. It has also made claims that it has miniaturized a nuclear device and made progress toward developing a re-entry vehicle, two steps required for a deployable, long-range nuclear-armed missile. The South Korean Defense Ministry discounted Pyongyang’s claim to have mastered the technology for building a re-entry vehicle, but acknowledged that North Korea “may have made significant strides” toward a miniaturized nuclear device, according to a March 18 report from Seoul’s Yonhap News Agency.